This is one vision for indoor positioning, a fast-evolving technology that is allowing retailers to track shoppers’ physical movements along their aisles in unprecedented detail. In many big-box stores, equipment is already in place to sniff out customers’ smartphones and log data such as how many minutes a person spends in the shoe department. The technology could eventually give retailers capabilities rivaling those of online stores. On the Web, behavioral ads use records of a person’s browsing history to propose products. Now pharmacies or home improvement stores wanting to sell Kleenex or two-by-fours could soon do the same thing (see “It’s All E-Commerce Now”). 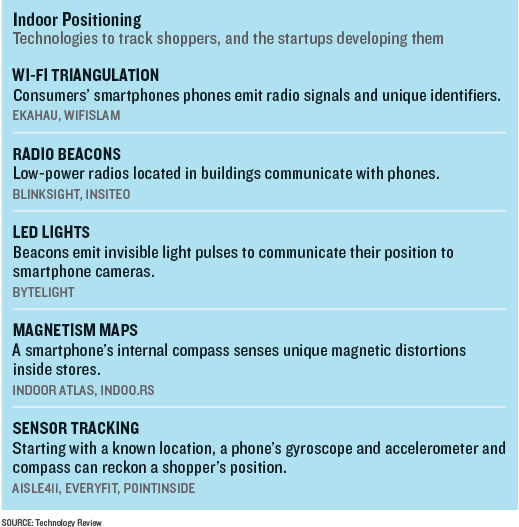 U.S. retailers including Nordstrom, Family Dollar, and American Apparel have experimented with indoor positioning. Some systems use videocameras, sound waves, or even magnetic fields. In September, Apple added a feature called iBeacon to its smartphones; it emits a low-power Bluetooth radio signal, also designed for indoor use. The most widely used technique is to intercept Wi-Fi signals emitted by shoppers’ smartphones. Triangulating on that signal can estimate the phone’s position to within a few meters. Stores also collect a unique identifier, called a MAC address, for each phone. That allows them to build up behavioral information on return visitors. Forest City Enterprises triangulates on cellular signals to monitor foot traffic in most of the nearly 20 shopping centers it owns or manages. It says the data helped it decide where to move an escalator that was interfering with an entrance. The company also measures how long visitors stay after a fashion show or concert. Stephanie Shriver-Engdahl, Forest City’s vice president of digital strategy, says the company wants to know, “Do they get one soda, hop in the car, and leave? Or are they staying longer?” In the future, foot-traffic data could be used to set lease prices, she says. But Don Dodge, a Google executive who has invested in several indoor location companies, believes the technology “will be bigger than GPS” or online maps. That’s because people spend most of their time indoors, he says, where GPS signals are often too weak to be useful. Before that happens, retailers may have to brave a privacy debate. Nordstrom suffered a public-relations black eye this year after it began tracking customers in 17 stores using a Wi-Fi system developed by Euclid Analytics. Some customers who read signs at store entrances explaining the technology complained about an invasion of their privacy. Since the Nordstrom episode, retailers have become reluctant to acknowledge their use of indoor tracking. But RetailNext, a company offering “comprehensive in-store analytics,” says its products are being used by 100 large retailers and in thousands of stores. Euclid also says it has 100 customers, including Home Depot.